You install a computer program so that you can do new things by using those programs — things you can’t do with the programs you already have. You can install a computer program to add new capabilities to your computer, such as creating greeting cards or drafting legal documents. Some programs are free; others cost money. Programs designed for professional work may cost hundreds of dollars. If you are a user of Windows 10, check out the article on Installing Programs on Your Windows 10 Desktop. Insert the program disc into your computer’s disc drive or tray, label side up (or, if your computer has a vertical disc slot instead, insert the disc with the label side facing left). The AutoPlay dialog box appears. Click the option to run Install or Setup. 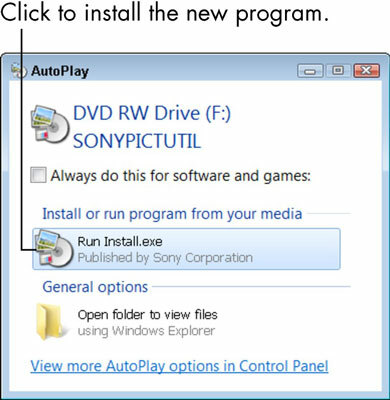 If nothing happens when you insert the disc, choose Start→Computer to open the Computer window; double-click the icon for your DVD or CD drive; and then double-click a program named Setup or Install. If the installer offers a language selection, choose yours; likewise, agree to the end-user license agreement, if requested. Many installers require you to accept an end-user license agreement (EULA). You can read the EULA or not, but you can’t install without agreeing to its terms. If the installer offers Express or Custom installation options, choose the Express option to let the installer set up the program without further input from you. The Custom option or Advanced Settings allows you to specify where to install the program and, perhaps, which parts of the program to install. Some installers provide other options to install documentation and other programs or to register the program. As the installer program continues to run and display dialog boxes, click the Next or Continue button. You proceed to the next dialog box each time you click. Click the Finish or Close button in the last step of the installer program to complete the process. In a few cases, the setup program may ask you to restart Windows 7. In this case, you don’t have to restart immediately, but you won’t be able to use the new program until you do restart. 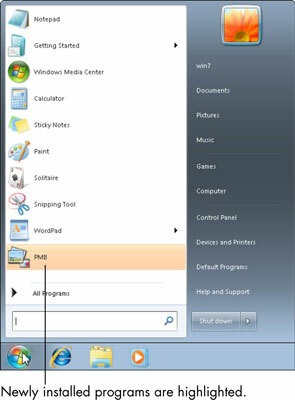 The new program may appear automatically at the bottom of the first screen of the Start menu. Look under All Programs as well. 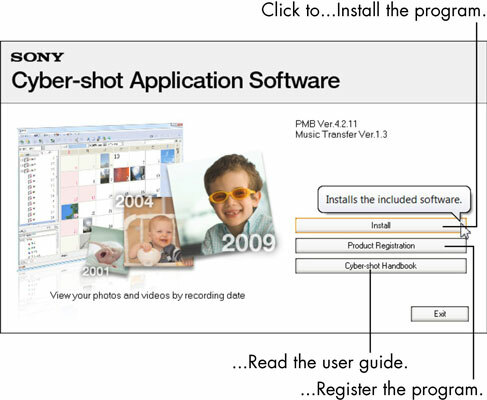 Newly installed programs are highlighted in color. Some installers add a program icon to the desktop. Many programs try to connect to the Internet for updates during installation or when you run the installed program. The first time you run a program, you may be asked if you want to register the program or configure some aspect of the program. Go with default (assumed) responses, if you’re not sure.